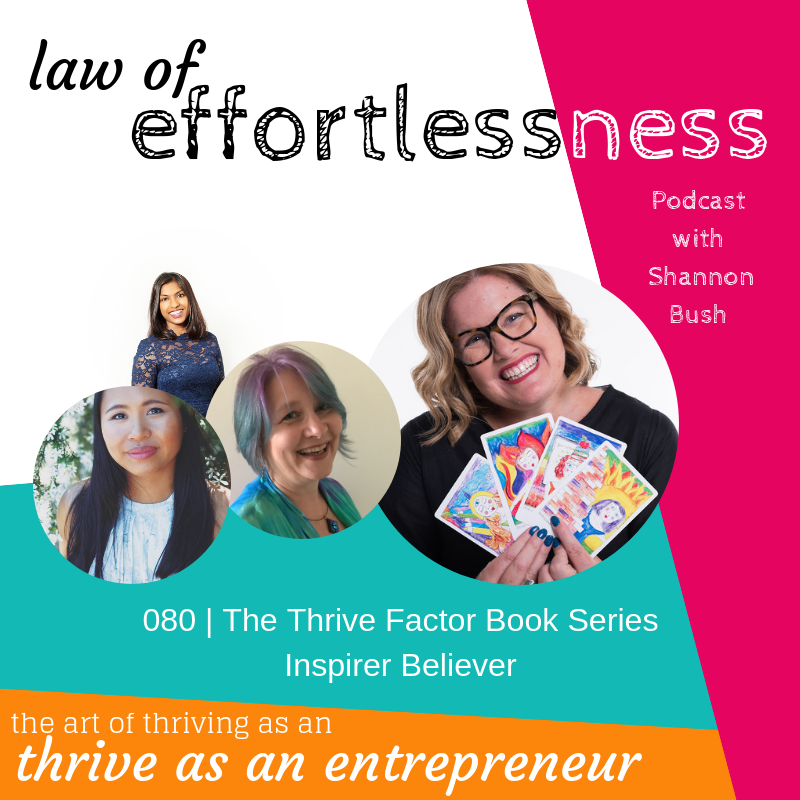 Welcome back to a new episode of the Law of Effortlessness Podcast where right now, we’re celebrating the launch of Amazon Bestseller, The Thrive Factor Book by #businessyoda Shannon Bush! If you’ve been tuning in recently you know we’re getting up close and personal with each of the 12 personal leadership Archetypes for women in business from The Thrive Factor Book and today, we have the pleasure of meeting the Liberator Engineer with guests Helen Hart, Stephanie Powell and Shannon Bush as they share the joys and challenges and strengths this freedom loving archetype presents! The Liberator Engineer is a lover of engineering systems and processes that result in freedom for herself, her biggest challenge is understanding what freedom means to her in all forms, and when freedom isn’t present she becomes frustrated and can even have something of a volcanic eruption or implosion of anger or illness. Join Shannon for the inside scoop on the Liberator Engineer from Clinical Hypnotherapist and Neuroscience Researcher Helen Hart. 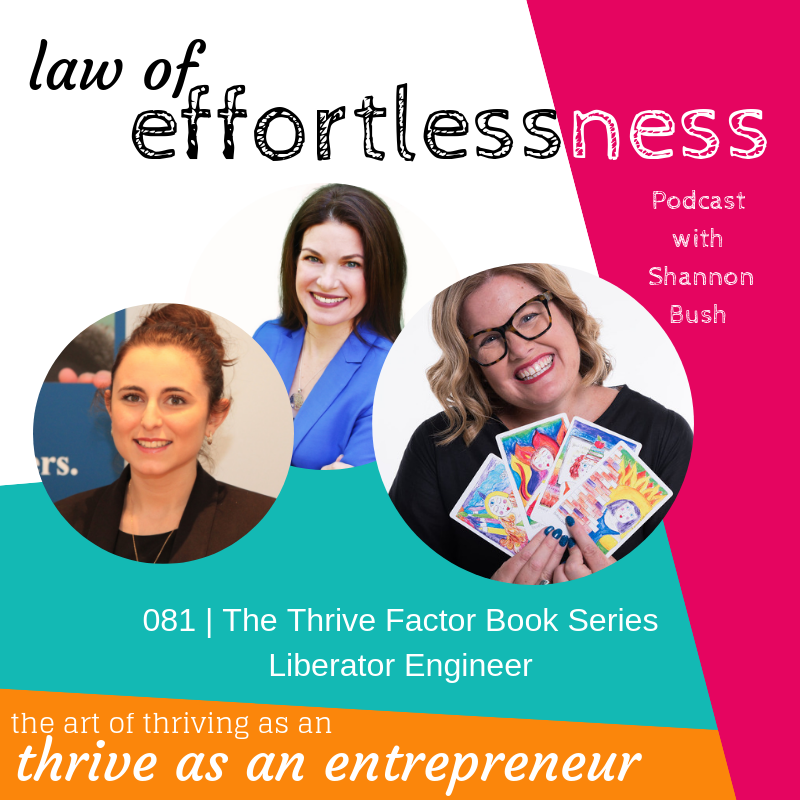 Helen shares when she very first discovered The Thrive Factor Archetypes back in 2013 with the launch of Shannon’s first best selling book and the freedom she found in those pages and understanding that came with it. Helen delights in her love of structure and process which gives her the gift of freedom. Stay tuned to hear from Associate Lawyer, Stephanie Powell who shares her experience of the Liberator Engineer and how for a long time, she felt like her personality kept contradicting itself but when she met Shannon and learned her Archetypes, she felt a huge shift and as if there was an explanation for who she was. Stephanie shares how she has to rein her Liberator Engineer in from time to time and re-frame her natural impulse for frustration or anger and how she uses her Archetypes in her legal work. You’ll also hear from the Liberator Engineer #businessyoda herself, Shannon Bush as she shares her experiences of being a structure and freedom-loving Liberator Engineer including how she was surprised to discover this side of herself! Shannon shares how as much as systems create freedom for her, that it’s also very easy for it to be confining and frustrating. You’ll hear Shannon talk about what happens when freedom feels like it’s in short supply – eruptions of anger and frustration, or becoming sick or breakdowns in the carefully engineered systems. You’ll also hear an amazing insight into how the Liberator Engineer bumps up against anything egotistical or ego-driven. This entry was posted in Business Success, Business Wisdom, Creativity, Effortless Success, LOE Podcast, Mindset, Personal Leadership, Small Business, Success Resources and tagged archetypes, Archetypes for women in business, Business, Business Coach, effortless success zone, law of effortlessness, leadership, Liberator Engineer, marketing, Marketing Coach, Personal Leadership Archetypes, Perth WA, podcast, The Thrive Factor Book on February 11, 2019 by Ashleigh Rae. 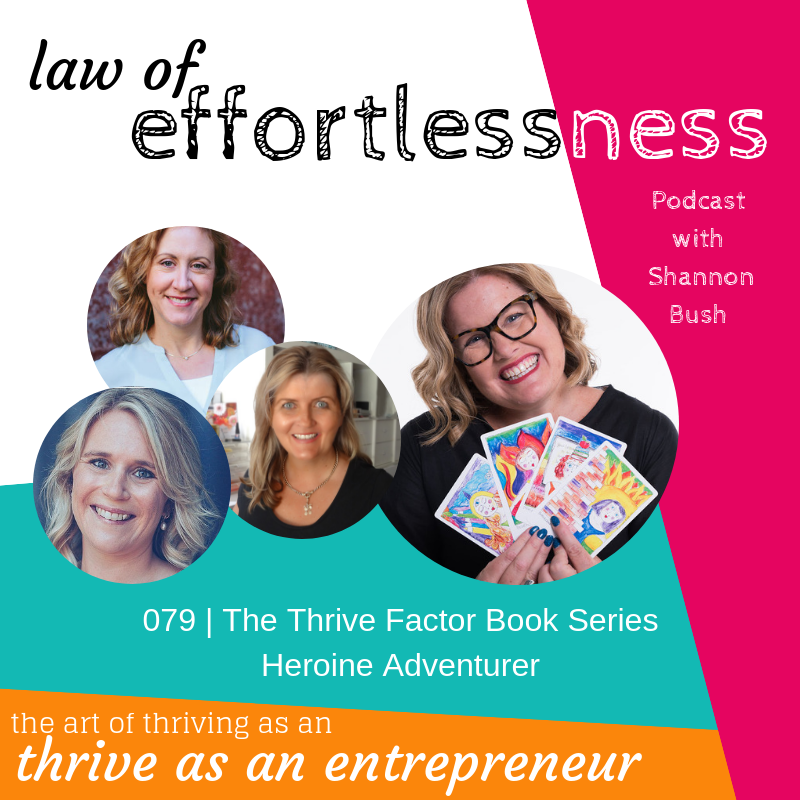 Welcome to the second installment of The Thrive Factor book series with your host, Shannon Bush, today joined by Emma Halyer, Tanita Seton, Kelly Weaver – three women with the Heroine Adventurer Archetypes! The Thrive Factor book featues 12 personal leadership Archetypes for women in business. The Heroine Adventurer is a great lover of the outdoors and nature, she loves to get out there and fiercely defend the underdog and is grounded by being in nature. Heroine Archetypes are also the most competitive of all the archetypes and become incredibly focussed when they have a challenge or goal in mind. Join Shannon in a delicious discussion with Emma, and what is was like getting to know this side of herself. Emma shares how she always knew she had a wild side, but never understood how she fit in. 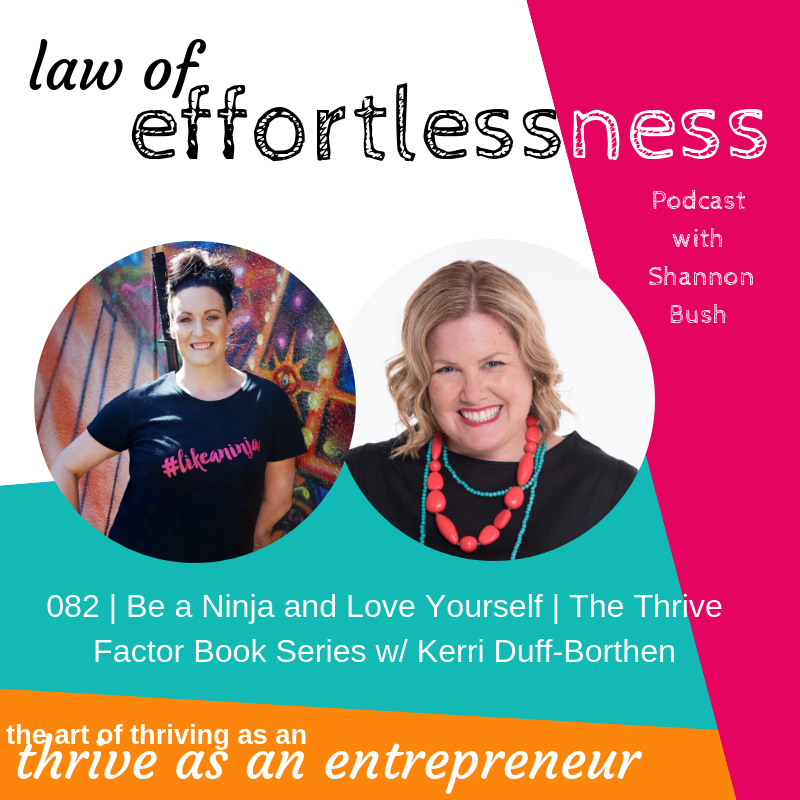 You’ll hear Emma talk about how she now embraces this part of herself to fight fiercely for her clients and drive her passion – and the challenge of keeping her in balance and not all-consuming. Stay tuned to learn from Kelly Weaver from Bridal Bling’s experience of getting to know her inner Heroine Adventurer, including being involved with sports, and the fearlessness and loyalty that is fiercely present. You’ll hear Kelly share how the Heroine Adventurer drives action for her, and how rather than looking at a problem she looks to her archetypes to understand where any angst could be coming from. Keep listening to hear from photographer, Tanita Seton shares how the Heroine Adventurer is one of her favorite archetypes. You’ll hear how Tanita is expressing her Heroine Adventurer by getting outdoors with her dog, enjoying being out in nature to enjoy the headspace it brings her. You’ll also hear the challenges Tanita faces in competing with herself and developing more self-compassion and care so she doesn’t fall victim not-enoughness. You’ll also hear some simple, practical tips from Tanita that will support you to embrace your inner Heroine Adventurer. This entry was posted in Business Success, Business Wisdom, Effortless Success, LOE Podcast, Mindset, Personal Leadership and tagged archetypes, Business, Business Coach, Business Coach Perth, Heroine Adventurer, leadership archetypes, LOE podcast, magnetic marketing, Magnetism archetypes, marketing, Marketing archetypes, Marketing Coach, marketing coach perth, Mindset archetypes, Money archetypes, podcast, The Thrive Factor Book on February 2, 2019 by Ashleigh Rae. 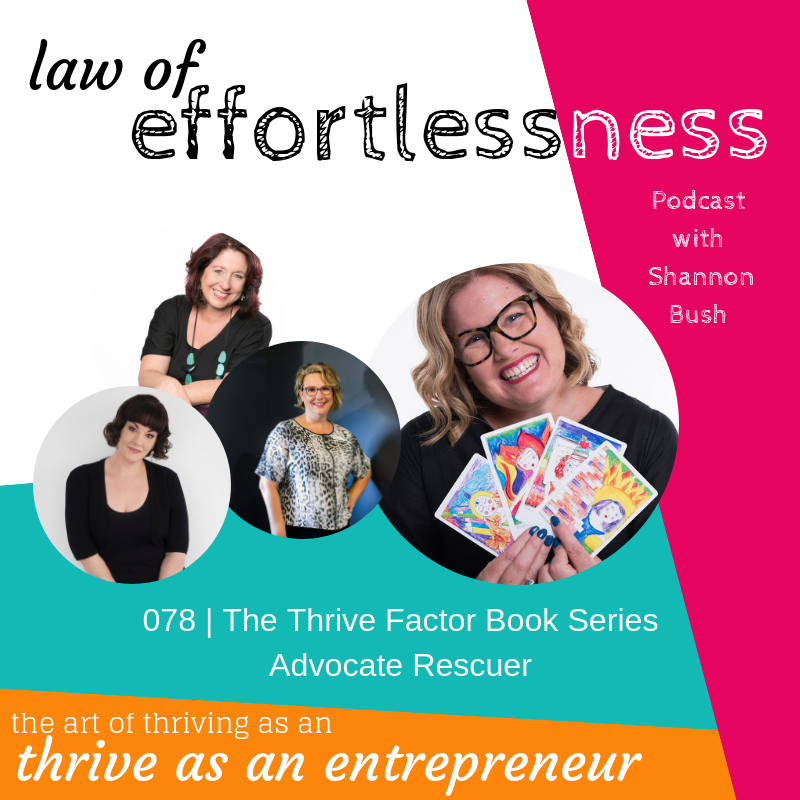 Welcome to the first installment of The Thrive Factor book series of Law of Effortlessness Podcast – last week, you heard Business Coach Shannon Bush talk briefly about each of the twelve archetypes, and today you get to meet just a few of the amazing women Shannon has profiled as an Advocate Rescuer. These women have bravely put their hands up to share their experiences and wisdom after uncovering their archetype as the Advocate Rescuer. In this powerhouse episode, you’ll meet Yvonne Atkinson, Angelique Bavich, Kylie-Jo Barker who share their stories and insights post-profiling and what it means to them, their strengths and challenges, and how they use the knowledge and insight to create thriving businesses. Tune in to hear Shannon chat to Yvonne about her Advocate Rescuer as Yvonne describes her first encounters as being hard, frustrating and heavy – and how she now uses the archetype to be the balancing factor to the other archetypes that are present, and how she came to embrace this side of herself. Keep listening for Angelique’s take on the Advocate Rescuer archetype including her experiences of learning to say no to things, in order to say yes to herself, and how that, in turn, teaches her family, friends, and clients to care for themselves and put themselves first. You’ll also here Angelique speak about the challenges she faces in knowing the difference between helping and rescuing someone. 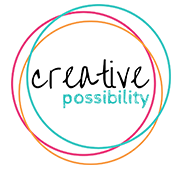 Shannon finishes this episode with one very special guest, Kylie-Jo Barker who had been part of the Creative Possibility team for a long time. Kylie-Jo shares how learning that she has a voice, and it is valuable and valid has been the biggest blessing, and challenge and how she has learned to recognize when she is and is not using her voice effectively. What is the Amazon #1 Best selling book The Thrive Factor about? The Thrive Factor book featues 12 personal leadership Archetypes for women in business, providing valuable information for each archetype on its expression of mindset, marketing, money and magnetism. This entry was posted in Business Success, Business Wisdom, Effortless Success, LOE Podcast, Magnetic Marketing, Marketing, Mindset, Money & Abundance, Personal Leadership, Small Business and tagged Advocate Rescuer, Archetypes for women in business, Business, Business Coach, Business Coach Perth, effortless success zone, LOE podcast, magnetic marketing, Magnetism archetypes, marketing, Marketing archetypes, Marketing Coach, marketing coach perth, Mindset archetypes, Money archetypes, Personal Leadership Archetypes, The Thrive Factor, The Thrive Factor Book on January 31, 2019 by Ashleigh Rae. 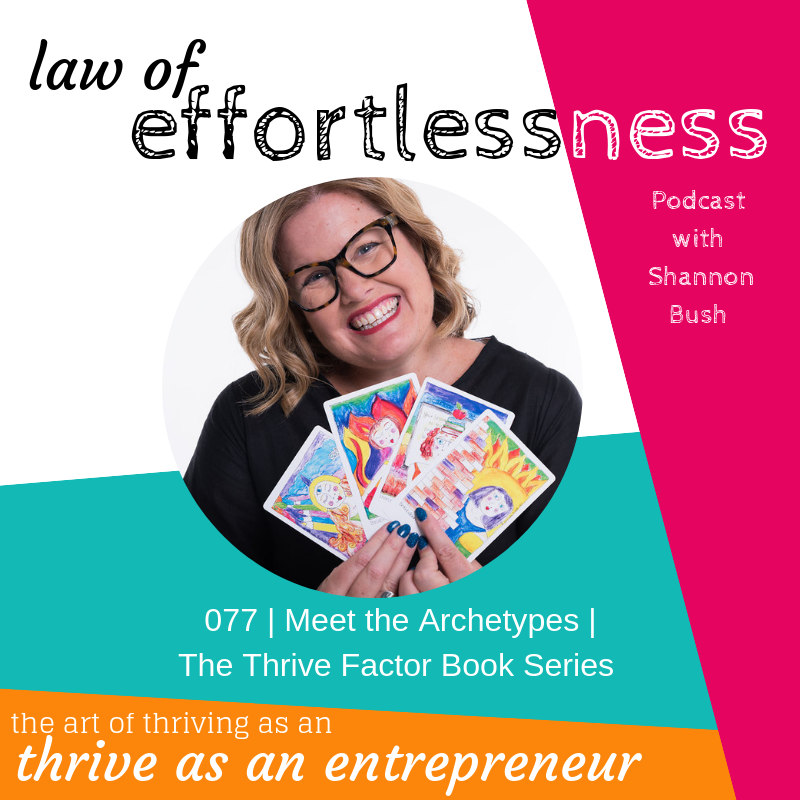 The Thrive Factor Book is Almost Here… and it’s Time to Meet the Archetypes! Watch this episode as a video also and see Shannon share this awesome info here. 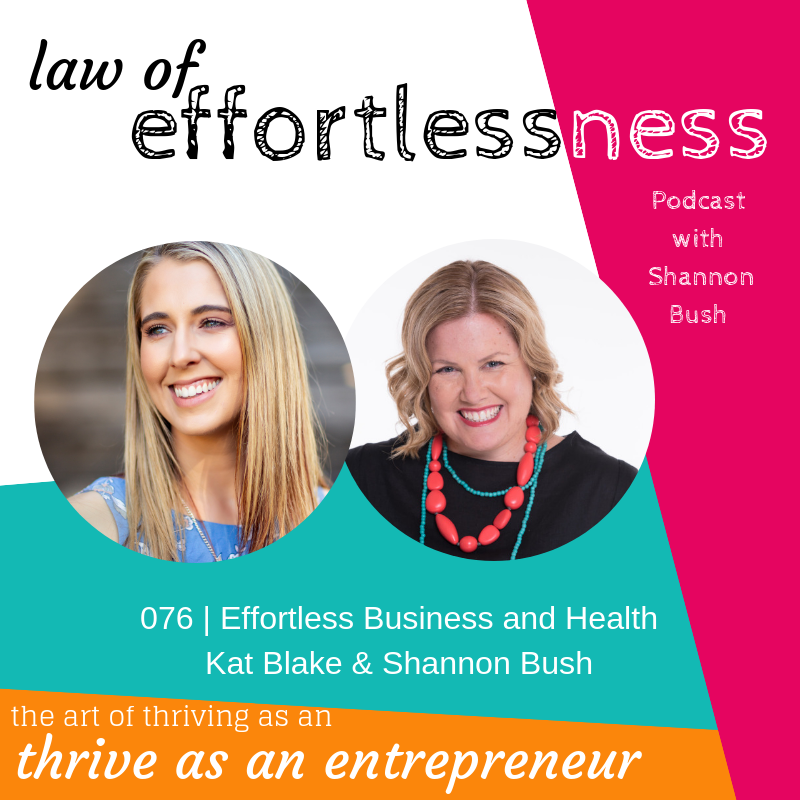 Welcome to a very special episode of Law of Effortlessness Podcast with #businessyoda Shannon Bush! 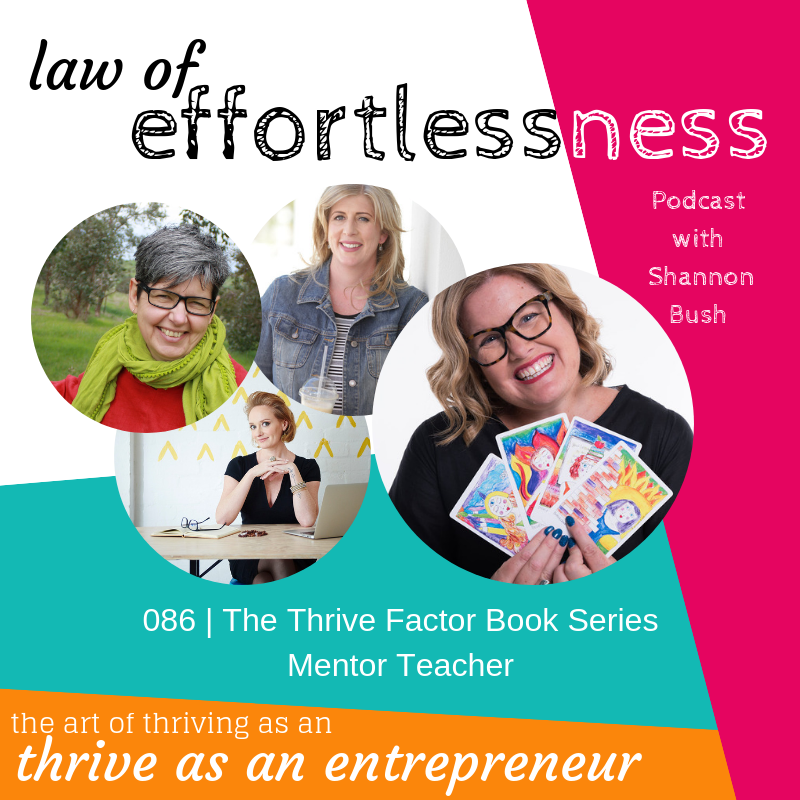 In this special episode, Shannon shares with us the announcement of her new book, The Thrive Factor – with a juicy behind-the-scenes peek at how this book came to be! In 2013 Shannon published her first book, The Personal Leadership Style after two and half years of research and study in psychology, transpersonal art therapy, and archetypes and the patterns of behaviors and challenges she saw in her clients – her first book introduced the world to the twelve archetypes Shannon uncovered and developed and now, The Thrive Factor Book is here and has superseded it! The Thrive factor Book is here to help you meet different, or forgotten parts of yourself and to understand challenges and strengths – and to give you permission to own your strengths, challenges, to be more of who you are and want to be, bringing a fierce determination and confidence. Shannon has invited many of the women she has worked with over the years to share their experience of working with their archetypes and the difference it’s made in their lives and businesses – over 48 women sent in their stories and is featured in the book – and you’ll hear from some of them soon. After publishing the high-level first book, The Thrive Factor is a very in-depth look at each of these archetypes and how they interact with your Effortless Success Zone, focusing on your personal magnetism and inspiration which filter into your business – how people are drawn to you and inspired by you – a little different for each archetype! This entry was posted in Business Success, Business Wisdom, Effortless Success, LOE Podcast, Magnetic Marketing, Mindset, Personal Leadership, Success Resources and tagged Archetypes for women in business, Business Coach Perth, business coaching for women, business yoda, leadership archetypes, LOE podcast, magnetic marketing, Magnetism archetypes, marketing, Marketing archetypes, Mindset archetypes, Money archetypes, Personal Leadership Archetypes, podcast, Thrive Factor Book on January 30, 2019 by Ashleigh Rae.